I'm a new for BJS editor. How do I import mesh on BJS editor? I tried "Scene" / "Import Meshes From.." (See "bjs1.jpg"), but nothing happened. 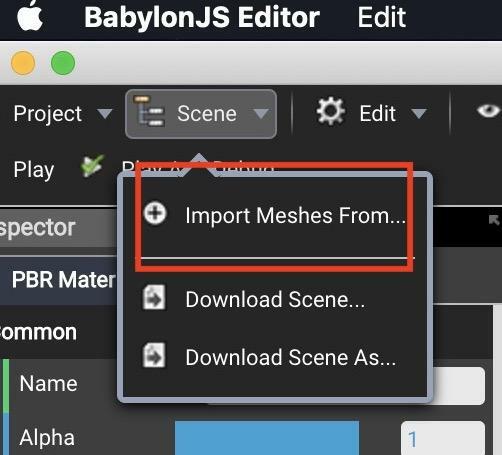 I also tried the same thing on BJS editor online (http://editor.babylonjs.com/). I got the following log. See also "bjs2.jpg". 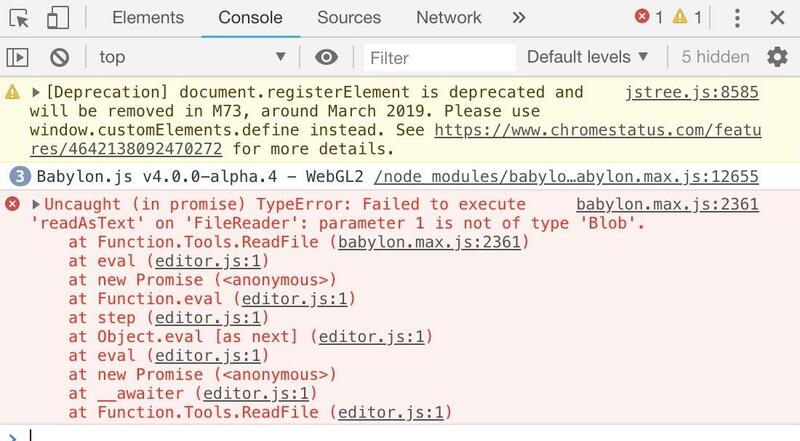 babylon.max.js:2361 Uncaught (in promise) TypeError: Failed to execute 'readAsText' on 'FileReader': parameter 1 is not of type 'Blob'. My BJS Editor version is v2.3.5. @Luaacro I'd appreciate your quick reply for my elementary question. I exported a .babylon file from blender plugin, imported it to the editor. It works!